LPILE is a special-purpose program based on rational procedures for analyzing a pile under lateral loading using the p-y method. LPILE solves the differential equation for a beam-column using nonlinear lateral load-transfer (p-y) curves. 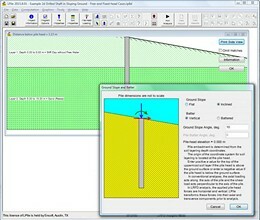 The program computes deflection, bending moment, shear force and soil response over the length of the pile. 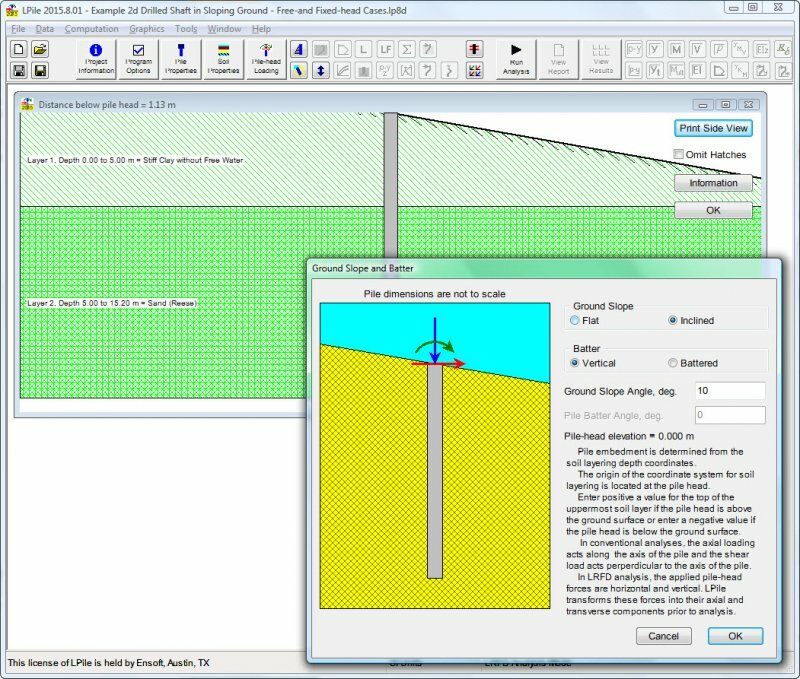 Components of the stiffness matrix at the pile head may be computed internally by LPILE so users can incorporate basic soil-structure interaction in their super-structure analyses. LPILE also provides graphs of pile-head deflections for various pile lengths, to help users with optimum pile penetrations (for lateral response). Push-over and buckling analyses may also be optionally performed by LPILE. Nonlinear lateral load-transfer from the foundation to the soil is modeled using p-y curves generated internally using published recommendations for various types of soils. Special procedures are programmed for computing p-y curves for layered soils and for rocks. Alternatively, the user can enter manually any other externally generated p-y curves. Five types of pile-head boundary conditions may be selected, and the structural properties of the pile can vary as a function of depth. LPILE has analytical features to compute the nonlinear moment-curvature relationships and nominal moment capacity of a pile’s section based on specified pile dimensions and nonlinear material properties. Optionally, the user may enter nonlinear moment-curvature relationships to be used in place of the internally-generated values. LPILE provides several design recommendations for rebar arrangements in drilled shafts. * The demo version is actually the full program but will not allow users to save or run new data models. However, various previously-run example files are installed with the demo version. Users can open each example file to look at the type of input data parameters used in various applications and also observe corresponding output graphics and text files that were produced by the program for each model. * LPILE download link provides demo version of the software. No one has rated LPILE yet. Be the first to rate this product.